Yes, the racing world is stretching the boundaries, with 100ft foiling maxi trimarans tearing around the globe and F50s, the ex-American’s Cup catamarans, now turned-up to sail at 50+ knots for gladiatorial-style stadium racing. But it’s the production monohulls, growing ever more popular among cruising sailors, that are pushing this industry forwards. The sector is a constantly bubbling melting pot of new ideas and models – some of which we explore in this Multihull Guide. 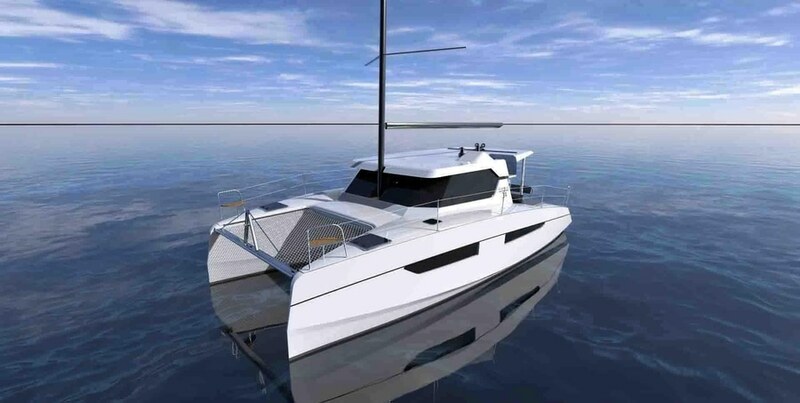 In fact, the multihull market has grown so much that the world’s largest boatbuilder is launching its second catamaran range to appeal to younger, sportier sailors. A new 40-foot flagship has been unveiled by Denmark’s folding trimaran specialist Dragonfly. The boat won’t reach the public eye until the Dusseldorf Boat Show in 2020, but we already have a good idea of how she will look and perform. The cockpit has been the focus of much of Dragonfly’s design work, with twin wheels and an optional bathing platform transom. It is also wider than on previous models, allowing sail controls to move aft for easier short-handing, and giving easy access to the stern for Med-style mooring. The mast is in lightweight carbon – 18.5m tall for the Ultimate version of the boat or 16.5m for the Touring edition. Displacing just 4.9 tonnes in her ready-to-sail state, the boat is forecast to be capable of speeds up to 24 knots. Other details are scant at the moment, except that Dragonfly is putting the emphasis on easy handling. The trademark folding crossbeams give her a beam of just 4m, down from her full span of 8.5m. The folding process slightly increases her length – from 12.1m to 13.5m. At this size, the boat is clearly not trailerable, unlike her little sisters, but with the Quorning yard’s high reputation, expect scintillating performance. Dragonfly has given the performance variant of its popular 32-footer a makeover. The old Supreme will be replaced with the Evolution, which sports a new wave-piercing float design and 20 per cent more buoyancy to make the boat more comfortable in strong winds and tougher conditions. The rudder section is slightly improved, to resist stalling in extreme conditions, and the new boat will premier at Dusseldorf this year. Pictured is the first 32 Evolution sailing and with the first of Dragonfly’s contemporary new Elm interiors. Lagoon says greater comfort is a key goal of its new model, the 46. The French yard has charged former Renault designer Patrick le Quément with the task of meeting owners’ expectations about comfort in a market where the ‘cruising experience is becoming a lifestyle’. The design team at VPLP has made fundamental changes to the successful formula of the old 450. Chief amongst these is moving the mast of the 46 further aft on the coachroof. As a result the jib becomes a self-tacker, and the larger forward triangle offers a greater choice of downwind sails. The boom has been shortened and the main has a higher aspect, reducing pitching. The flybridge helm has been centred and sits directly behind the mast, which means that the footwell protrudes slightly into the cockpit below – something that has been disguised by turning it into a deep frame for the sliding aft windows of the saloon. There’s a sliding stool in the cockpit, and a hydraulic bathing platform. Italian designer Nauta has made efficient use of the available space with queen-sized beds in all three (or four) cabins, plus a stylish-looking saloon. At 16.6 tonnes displacement, this is no lightweight racer, but it will get you to your destination in comfort. In the hotly-contested 40-something foot category, the Groupe Beneteau team behind Lagoon and CNB luxury monohulls is carving out a new cat brand called XCS. It is pitched at younger, sportier sailors with the tagline ‘be immoderate’. That translates in part to a bigger sailplan than ‘standard’ cruising cats, and with a higher aspect ratio – that is, tall and thin. This positions the mast further aft and allows a self-tacking jib. The boats will also feature twin aft helm stations, in contrast to many production cats. “It is the ideal position to keep an eye on the sea and sails, whether windward or leeward, and above all, it provides the most sensations at the helm,” explains project director Bruno Belmont. He also says that having a low boom close to the bimini will increase the mainsail’s performance. There will be plexiglass in the hardtop for a better view of the sails, or the option of a fully retractable bimini. Snippets of video posted online hint at a longeron between the bows offering a tack point for reaching and downwind sails. And the hull has heavily bevelled topsides with a striking chine just above the waterline, as well as generous curved hull lights. Three interior layouts will be available, with pared down furniture to save about a tonne of weight. It all adds up to a boat that should be faster than the standard cruising cat, though short of the “super fast” technical offerings from the likes of HH and Gunboat. There will be five sizes from around 36ft to 50ft, and the first two models will be launched at Cannes Boat Show in September. The French bluewater cruising cat specialist has continued its range refresh with a replacement for the hugely successful Helia 44, which has sold 260 hulls since 2012. The new 45 was drawn by Berret Racoupeau, and is slightly bigger in all dimensions. In line with current trends, it offers more creature comforts but at the cost of nearly 1.5 tonnes additional weight than the Helia. That is partly offset by a larger 74m2 main and by a lower wetted surface. “It means a higher top speed and more comfortable under engines,” says marketing manager Helene de Fontainieu. What you get for the extra weight is compelling. The bulkhead helmstation has been remodelled to improve line handling. Inside there is a bigger saloon with a huge galley down the port side and a dedicated navstation aft. There’s the new 8.5m2 forward lounging space, a barbecue in the transom seat and the option of a hydraulically lowering ‘beach club’ (swim platform and tender lift). There are still sunbeds on the coachroof, and a seating area on the flybridge. The designers have introduced more light, with extra glazing in the saloon and the cabins. The 45 hits the water in the summer. After years of development and design work and over a year in build, the first Gunboat 68 has emerged from the yard at La Grande Motte, southern France, and will be launched in late January. Hulls two and three are also in build. Fresh details have emerged about the design itself. The hull is finished with paint rather than gelcoat in order to save weight, and to allow customisation to continue long after the boat emerges from the mould. Hull one is painted in dark silver Awlcraft, containing real flakes of metal. Meanwhile, the interior finish is super-light fabric panels that can easily be removed and offer a degree of insulation as well. “The bulkheads are, in effect, triple glazed,” says Gunboat COO William Jelbert. The high-aspect, heavily raked rig comes in performance cruising and regatta versions. In the first, the boat will only fly a hull in more than 20 knots of true wind, whereas the racing rig achieves this at 16 knots with a rotating mast that is 4m higher. Velocity predictions suggest the regatta rig will perform 12 per cent better upwind and 20 per cent better downwind. Gunboat also went back to basics with Jefa to design the steering system with the help of Michel Desjoyeaux. The 25kg carbon blades are fully retractable, sacrificial in the event of a collision and the whole system is designed to support T-foil rudders in the future. Look out for hull number one at the BVI Spring Regatta. A combination of sharp design, punchy performance potential, comfort and build quality brings plenty of appeal to this sporty new Italian-built cat. Its light displacement of 10.5 tonnes (fully loaded 13.5 tonnes) is impressive thanks to an E-glass epoxy-infused build with carbon strengthening. The layout will suit those wanting to actively helm. I like the position of the helmstations, with optional swing-out wheels, which give good forward views over the low coachroof. A central aft winch is employed for halyards and reefing lines, which helps keep the cockpit clear of lines. Despite the lightweight composite build, weight is permitted where it will aid comfort, such as with the use of proper glass windows surrounding the coachroof and resin worktops in the galley. Elsewhere furniture is built in sandwich balsa with a teak veneer finish. 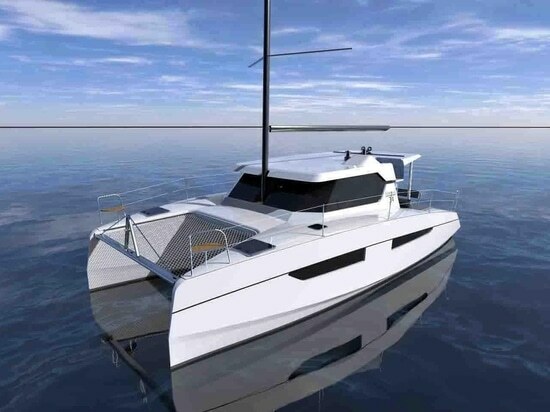 Designed and built in Italy, the first Dufour catamaran was hastily finished in time for the Cannes Boat Show last September. “This is the only cat of this size with a proper flybridge” said Umberto Felci on showing me his new design, “which is divided into three areas of driving [single helm], seating and sunbathing”. The flat coachroof top is huge, which, together with the flybridge seating is designed to act as a second cockpit. The aft position of the mast meanwhile creates a sizeable area for a self-tacking, non-overlapping jib. There are nicely proportioned amounts of space inside for the cockpit, main deck and galley. I like the island worktop around the mast base to extend the galley. Guest cabins each have their own companionway entrance. Sunreef is a ‘small family business’ that has grown to its current €50m turnover, said CEO Francis Lapp. He was addressing at least 30 journalists on the aft deck of the first Sunreef 80. The boat is the queen of a new range that sees the Polish firm targeting the large charter market of 50ft–80ft crewed cats (around 80% of Sunreefs go to charter). Business is booming, according to Sunreef, which says it has sold eight of the new 80s, eight 60s and ten 50s off the plans. Sunreef already has 500 employees and is looking for more to help meet this incredible demand. The amount of space on offer on the new 60 and 80 has to be seen to be believed. The designs feature enormous open-plan saloons and adjoining cockpits, which are designed with very little fixed furniture – allowing them to be customised or to double as party lounges. And the flybridges, mostly with Jacuzzis, offer alfresco dining areas and yet more sun lounging space (oh, and the helmstations). The first 60 to launch is a charter version with five guest cabins, while the privately owned 80 has the largest owner’s cabin I’ve ever seen on any size sailing yacht. The MC50 stole the show when it launched at La Grande Motte in April last year. Just four months later, McConaghy was back with its second Jason Ker design, the MC60, at Cannes Boat Show. It’s very much the larger sister and similar design to the MC50, sharing many of its standout features, including the aft flybridge helmstations, hydraulic centreboards and the sumptuous open-plan saloon and galley. Its main benefits come down to volume and length. “You get more waterline length for not much more weight,” says Ker of the MC60. There’s more empty bow space and a lot more volume. The British designer also thinks it’s a size that can still be owner-operated – indeed there’s not even a dedicated crew cabin option. McConaghy says the helm set-up, with its full views over the bows, suits those who want to sail the boat by themselves without a crew. The question remains how comfortable this position may prove in a seaway. The Design Unlimited interior is styled to suit each owner. The first boat has a very pale finish with light oak veneer masking the foam sandwich build. Again it’s the huge electric opening side windows and three longitudinal skylights in the saloon that help provide the overall wow factor. Never has a catamaran of this size offered so much living space. Bali takes its outdoor/indoor concept to a whole new level with its new flagship 55-footer. Similar to its previous designs, Bali uses an open one-level saloon, galley and aft cockpit area, with a garage-style glass door that swings down to close off the aft when required. The flybridge is also enormous, with the majority of space given to leisure area, however the boom is pushed up high and there’s only one helmstation. Accommodation space is also vast, stretched to both ends of the hulls. A solid deck is preferred to a trampoline to help increase foredeck cockpit space and forepeak cabins. Two aft compact cabins meanwhile, accessed from the aft deck, also help maximise the number of cabins available. These use clever doors that hinge up like car bonnets, which will likely only suit fair weather sailing. The four main transverse double guest cabins in the central hulls, meanwhile, are simply enormous. I often think it a shame that they aren’t more new mid-size (10m/35ft) coastal cruising cats developed these days. The family cruisers of yesteryear at this size (for example Prout and Gemini) are typically now 10ft longer, much more voluminous and consequently expensive. So I was keen to see this new offering from Aventura, a French brand which builds its more modest-sized cats in Tunisia. I like the overall design, the fine entry of the bows and the comparatively low freeboard (by today’s standards), which makes boarding much easier. Unfortunately there is no helm feedback while sailing in light breeze and swell, the single winch set-up is clumsy when tacking, and there is a lot of noise and vibration from the engines located under the aft berths. But this design still offers plentiful accommodation space. The Aventura has a modern-style single-level main living deck with connecting galley/cockpit. It boasts plenty of natural light, generous-sized berths with large hull windows and reasonable stowage in the cabins and galley. And the price is another pleasant surprise.